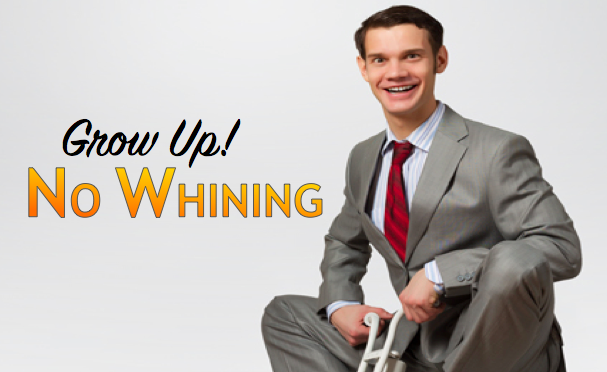 Sunday Rewind for March 12: No Whining - Growing in Christ. Over these four weeks at Christ Church, we are partnering with our new Children’s ministry. This four part series from Open.Life.Church challenges the young and old alike to move on to maturity and simply “Grow Up!” Don’t worry, we don’t want to rush childhood. But at the same time, nothing is more disappointing or sad than a childish adult. The purpose of childhood is to learn and move onto adulthood well prepared and mature. Likewise, if we are followers of Jesus Christ, we have been born again (see John 3). New to faith in Christ, we are like infants needing considerable care, support, and training. Over time, we intentionally seek to mature in our faith, knowledge, and obedience. We “grow up” in Jesus and move on to maturity. Sadly, too many church people get stuck in an immature, self-centered faith, happy to be served and throwing temper tantrums when they don’t get their way. For all of us, its time to grow up! Week 2: No More Whining! Its Time to Grow Up! “This is so unfair!” My four year old son bursts into tears when I don’t get him a snack. Never mind that dinner is less than half an hour away, he is certain he will starve. But what do you expect, he’s four. The sad reality is that many of us whine and complain to others and to God when we don’t get what we want when we want it. We may be more subtle. We may couch our whining and complaining in churchy terminology or share them as prayer requests. Yet, we all struggle from time to time dealing with our circumstances, vocally unhappy that things are not going the way we think they should. In the end, this whining and complaining reveals our immaturity and a lack of faith. Maturity is trusting in God’s love while patiently engaging in God’s plan. When my son whines and complains about a snack, the implication is that he thinks I don’t care about his hunger pains. He is forgetting my deep and abiding love for him. When we complain and whine about our circumstances, we too are essentially questioning God’s love and God’s wisdom. One day my son will (hopefully) mature. He might not like waiting, but he will come to understand that time passes. He will remember my love. Will we chose to do the same? We will remember God’s love and continue patiently engaging in God’s plan through our obedience and compassion. Take some time to think through the questions below. Would you like to join one of our weekly LifeGroups? What do you think when you see someone whining or complaining? Why do you think we commonly compare a whining person to a baby crying “wah”? What do you see as the root cause(s) for someone whining or complaining? Is there a common element to every complaint? What is it? Read Jonah 4:1-11. Why do you think Jonah complained so bitterly? In what ways was Jonah not trusting God love? In what ways was Jonah not trusting God’s plan? Read Philippians 2:1-18. Paul makes it pretty clear that Christians shouldn’t complain or argue. What is his reasoning for this command? What example does he point to? When you have a good attitude, what do you think it shows others? When you whine or complain, what do you think it shows others? How can Christ Church help you “grow up” and take a NEXT STEP with Jesus? Thank you for placing your sermons on Facebook. I am able to listen and continue growing in Christ through this venue. While in Florida, this allows us to still follow your sermon series. We are blessed to have you! Thanks again for your awesome sermons!